Many large companies decorate their facilities with posters or pictures that motivate their employees. 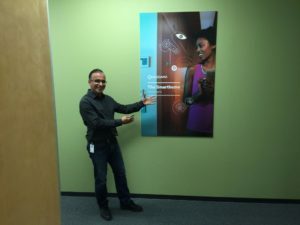 Our recent client, Qualcomm, chose to place large product posters around their local facility to remind their engineers of all the cool products they are working on. Black Parrot came out and removed their older posters that were mounted on heavy PVC material. This was a difficult job because, due to the weight of the older posters, they had to be stuck to the wall using a large amount of double sided tape and glue. Even with the difficulty, we were able to remove the older product with little to no damage to the existing wallpaper. We replaced the out-dated posters with larger ones that we mounted on the durable but much lighter Ultra-board material. Unlike Styrene that is easily dented, Ultra-board and Gatorboard have PVC surfaces with a tough foam core, allowing for durability without the weight of solid PVC substrates. The posters themseves were printed on 3M vinyl and laminated with a luster finish. The results were striking. 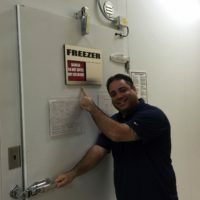 Thanks to Masoud, Charis, Daniel and the rest of the great people at Qualcomm for thinking of us for their local sign needs. We appreciate your business!